If there is one particular bane of modern day toys and gadgets, it would be this – most of them would require some sort of power source to run. The kids who grew up in the 1980s (and earlier) had their fair share of toys that did not require batteries, such as dolls and action figures, although there were also other toys like little robots of Nintendo’s Game & Watch which required batteries. 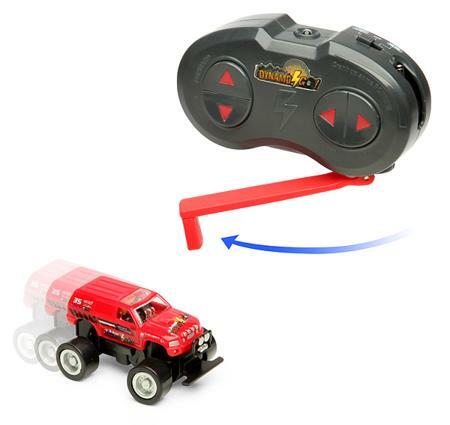 Remote controlled cars and robots have always run on batteries, but this time around, the trend is bucked with the introduction of the $19.99 DynamoGo Powered R/C Cars. As its name suggests, the DynamoGo Powered R/C Cars would not need any kind of batteries to keep it going. All you need to do is crank it up with your hand, and you are good to go. Each purchase will come in either red or green shades, so hopefully you end up with one that matches the color in your home. Of course, having to crank these puppies up each time before you play also means the amount of play time is rather limited, and you might have to do far more cranking than actual playing in the long run, but think of the amount of moolah you would have saved in the long run from not purchasing batteries!